The northern lights will have an expanded reach this weekend, increasing the chance that you finally cross it off your bucket list. Parts of the United States will have the opportunity to see the aurora borealis on the night of Saturday, March 23. 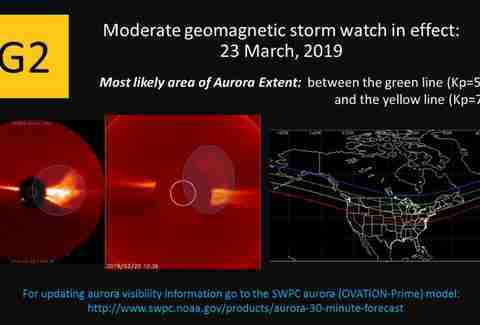 The Space Weather Prediction Center (SWPC) has issued G1 and G2 geomagnetic storm alerts due to effects associated with a solar flare that occurred on March 20. The impacts of that could help people in the northern US get a chance to see the display right outside their front door. The SWPC, part of the National Oceanic and Atmospheric Administration (NOAA), created the map above to highlight the area where the aurora could reach. Though it says the "most likely area of aurora extent" will be between the yellow and green line, you're more likely to see it only reach as far south as the green line. That's because the SWPC says the stronger portion of the storm -- the G2 watch -- will arrive between 2-5pm EST, you know, when it's still light outside. You're most likely to see the aurora in Montana, North Dakota, Minnesota, Wisconsin, Michigan, and Maine. Additionally, you should be able to spot it throughout Canada outside of small parts of southern Ontario, Quebec, and British Columbia. Though, if you're in the area as far south as the yellow line, which additionally includes Washington, Idaho, Montana, Wyoming, South Dakota, Iowa, Nebraska, Illinois, Indiana, Ohio, Pennsylvania, New York, Massachusetts, Vermont, and New Hampshire, it's possible you'll see the lights, but far from a guarantee. Of course, the aurora should also be visible in Alaska, but that's nothing new. Parts of Alaska are among the best spots to go searching for the aurora. The SWPC's 3-Day Forecast has a huge window in which the watches are active. It runs from 11am EST on March 23 through 2am on March 24. Of course, you won't spot the lights during the day, so you're looking at a window from sunset through 2am EST. To get the best view of the spectacle, you have to get away from the light pollution of urban centers. Even if the northern lights were to reach as far south as the yellow line on the map above, it's very unlikely that you could see the show from somewhere like Chicago or New York. An SWPC representative previously told Thrillist, "You need very clear skies, a good view of the northern horizon (no trees, buildings, or hills), and it needs to be dark." 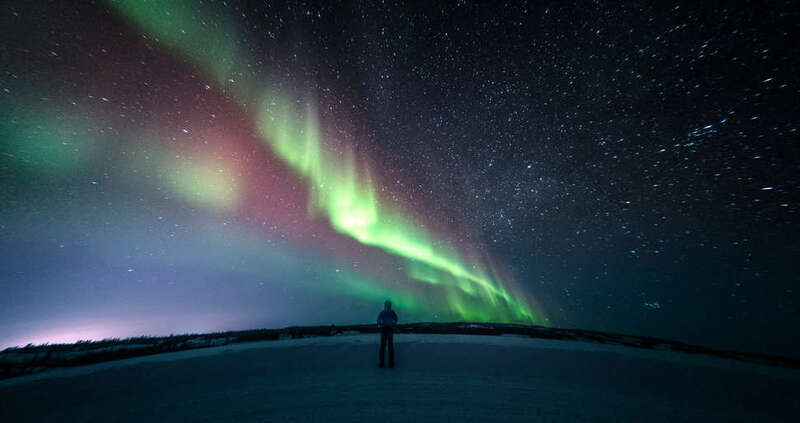 The view is necessary because, outside of far-north regions, the lights will largely appear on the northern horizon rather than directly overhead. It's an excellent way to welcome spring's return. Aurora hunters wandering out of the city this weekend won't have to contend with temperatures as frigid as they've been in recent weeks. Get out there, and see something amazing.